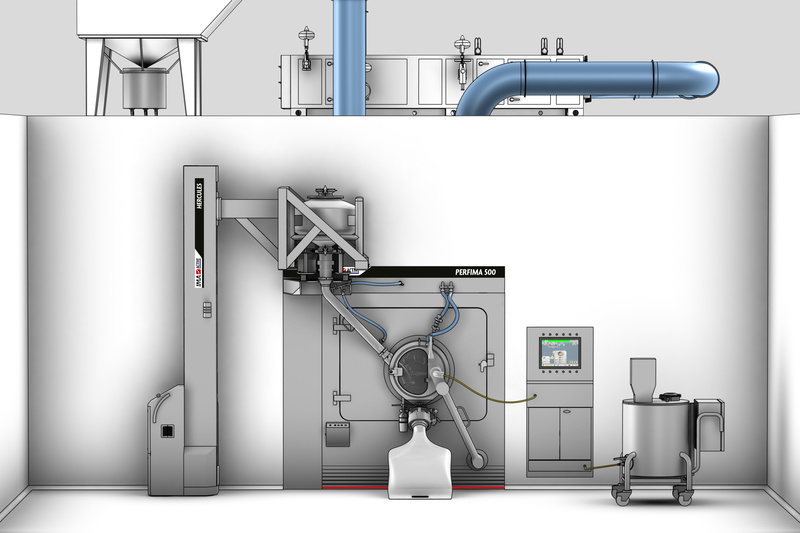 The increase in the development of Highly Hazardous Active Pharmaceutical Ingredients (HAPI) and consequently more restrictive regulations in terms of operators and environmental safety have brought a significant growth in the demand of process containment installations worldwide. With hundreds of installations for dispensing, blending, granulation, tableting, capsule filling, coating, washing, tablet counting, blistering up to 5 OEB products, both for production and R&D applications, IMA has a wide and constant knowledge of processing highly potent products. Containment installations must be designed on a risk based approach. A preliminary risk assessment has to be carried out to identify criticalities, considering the product features, the pharmaceutical requirements of the process to be performed and the plant conditions in terms of regulations, layout and industrial target. IMA is aware that containment has to be approached as a global engineering issue in a manufacturing plant. 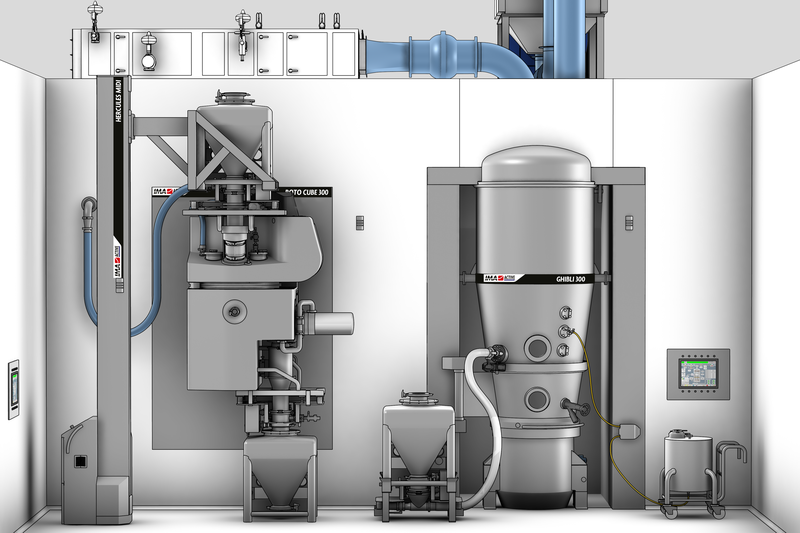 If you are thinking of contained Solid Dose production, IMA is the ideal partner for the development of technical innovations and dedicated solutions to your specific needs. TWINVALVE, high containment valve, at the discharge of an isolator for product transfer to the PH-BIN. 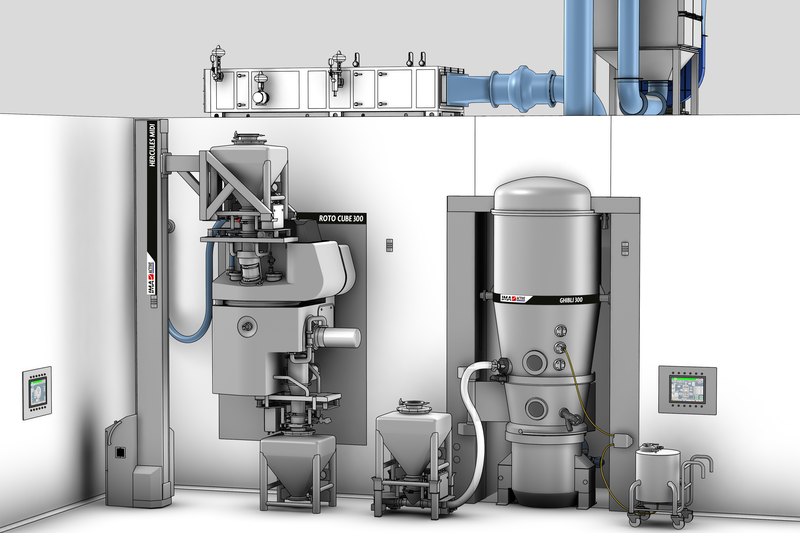 ROTO CUBE, single-pot processor, and GHIBLI, fluid bed granulator, equipped with isolation valves for contained product feeding and discharge. 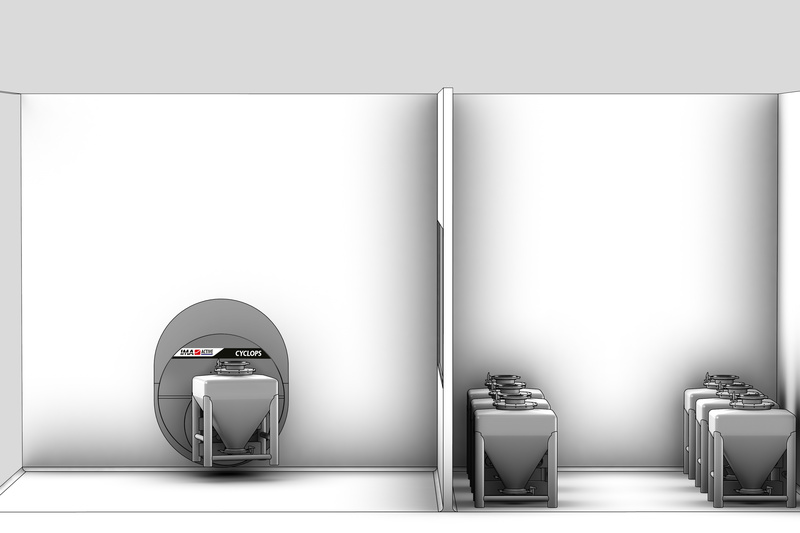 IBCs for product dispensing and blending with CYCLOPS bin tumbler. ZANASI THC, total high containment capsule filler, connected to a washable deduster. 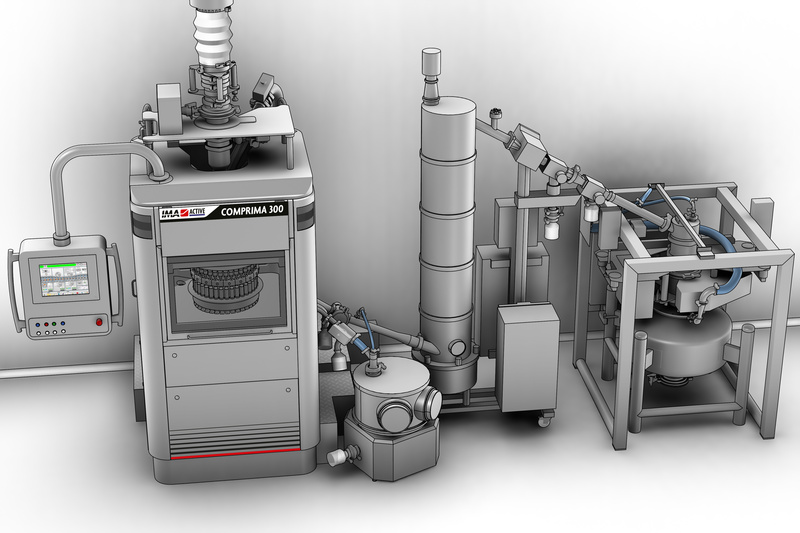 COMPRIMA, centrifugal die filling tablet press, equipped with TWISTER for contained powder transfer. 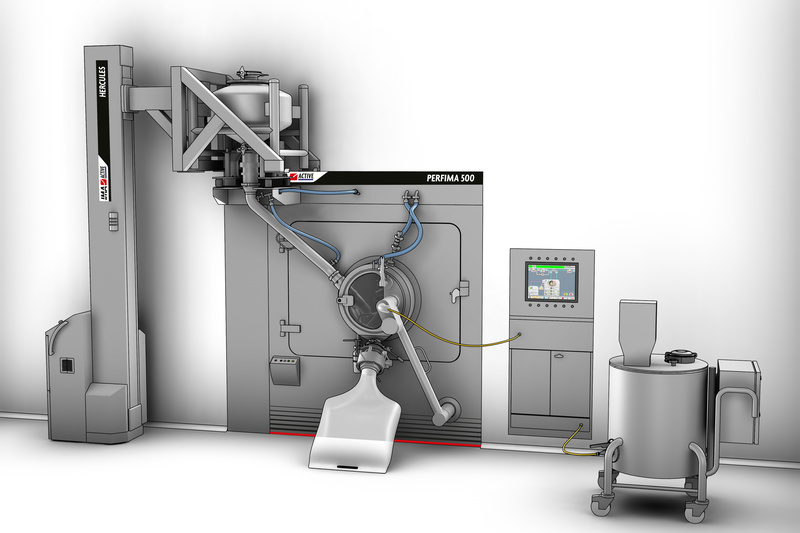 PERFIMA, perforated coating pan, connected to HERCULES lifting column and TWINVALVE for contained tablet transfer. 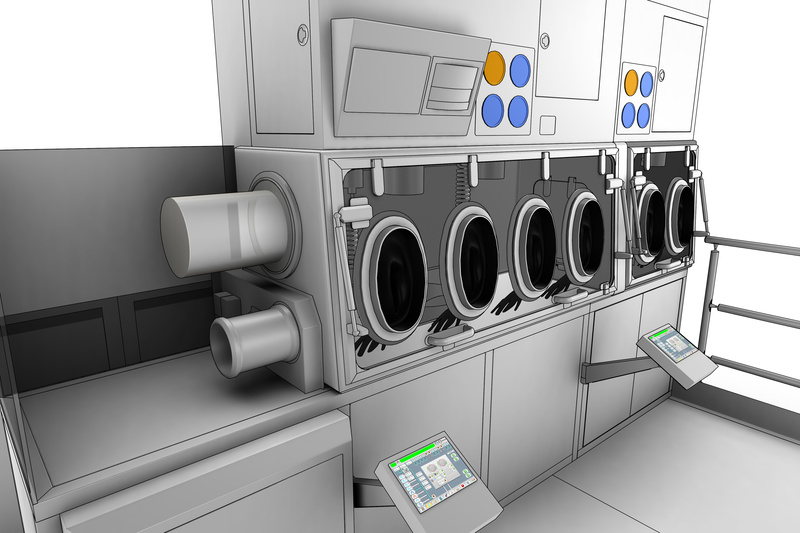 ATLANTIS, washing station, supplied with a second door for pass-through installation. 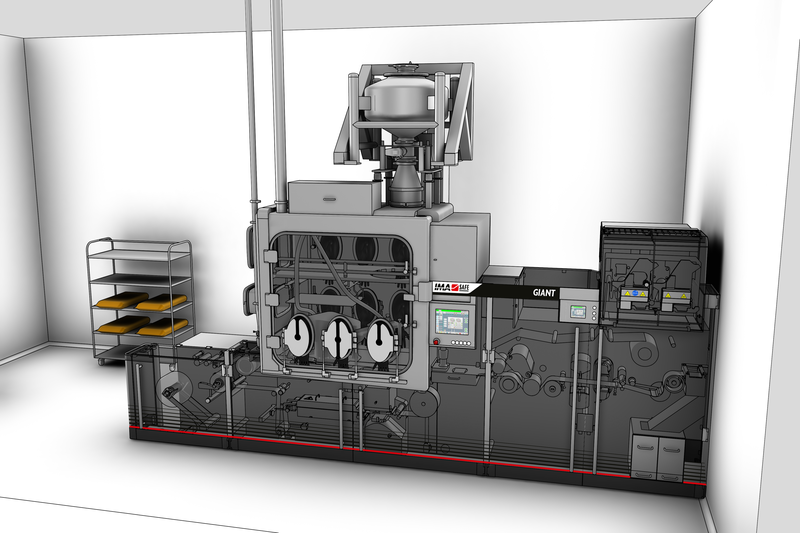 GIANT Series: complete integration between containment technology and blister packaging machine. Isolators can be supplied to achieve containment for the operations that normally foresee a close contact of the operator with HAPI. Product transfer to the PH-BIN can be easily carried out by using the high containment TWINVALVE, that achieves containment levels up to OEB 5. 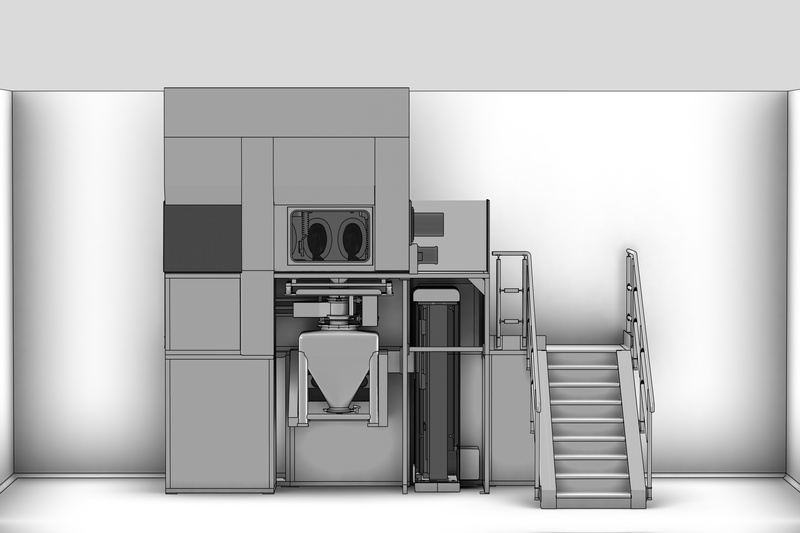 TWINVALVE is a simple and reliable solution to handle powders, granules, tablets and capsules. It can be used as a standard butterfly valve on bins and can be easily retrofitted on existing Powder Handling Plants allowing containment during powder transfer and high flexibility. This system is composed of two sanitary butterfly valves (active and passive) with a mini-hopper in between. 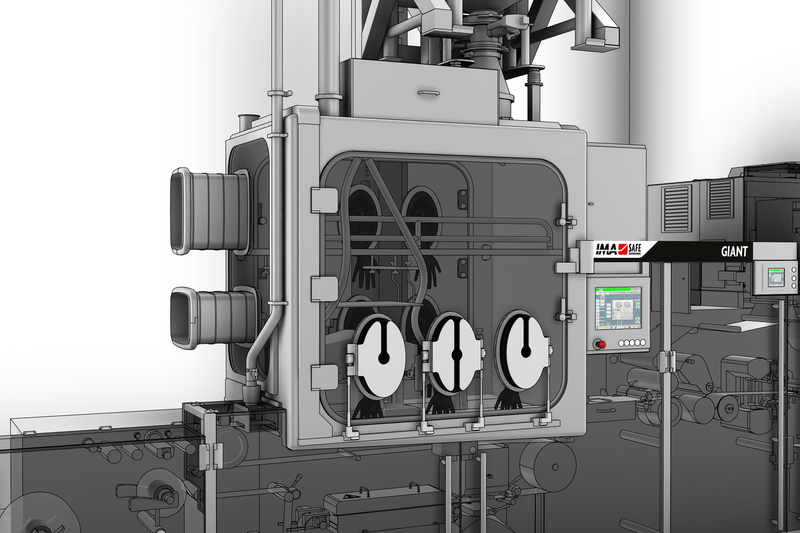 The passive valve is installed on a IBC and the active valve is installed on the machine inlet or outlet. 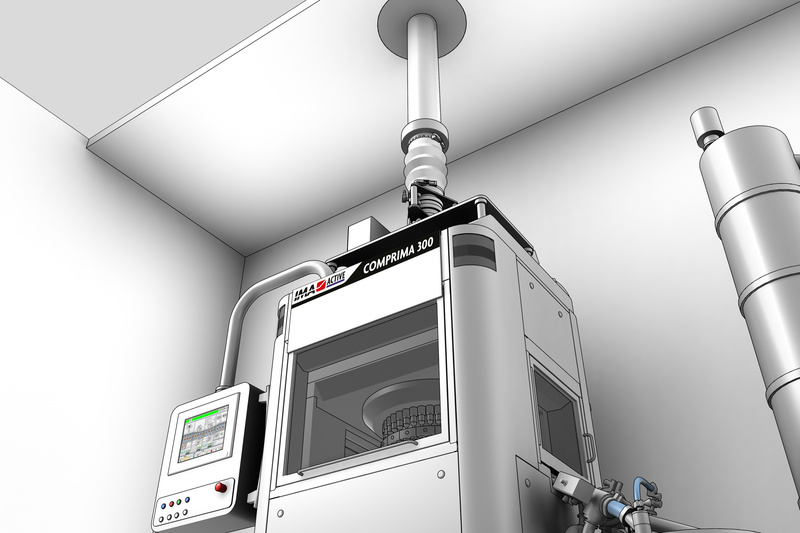 The small chamber that is created between the two valves when they are tight connected can then be cleaned by compressed air, water and/or other fluids before and after product transfer by means of a telescopic orbital spray head and vacuum. 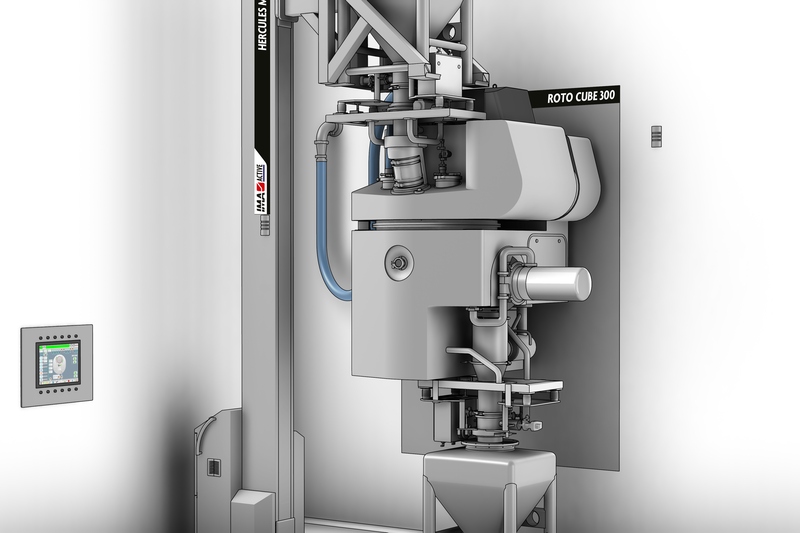 ROTO CUBE single-pot processor is equipped with containment valves for loading raw materials by gravity and discharging the granules directly into an IBC. 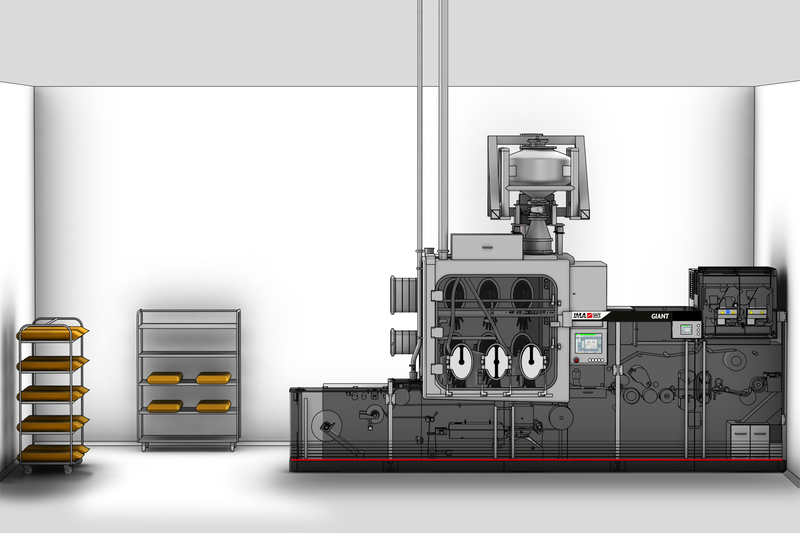 ROTO CUBE is very suitable for granulation of HAPI since its compact design and working principle maximize the yield, while reducing the product transfers and facilitating the cleaning operations. 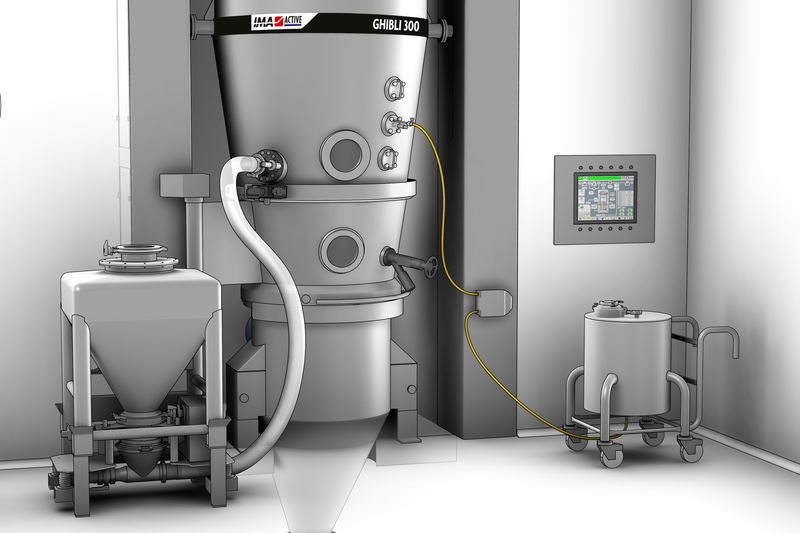 GHIBLI fluid bed granulator can also be equipped for high containment process, with the maximum filtration efficiency and automatic devices for cleaning, using containment valves on the charging and discharging ports. 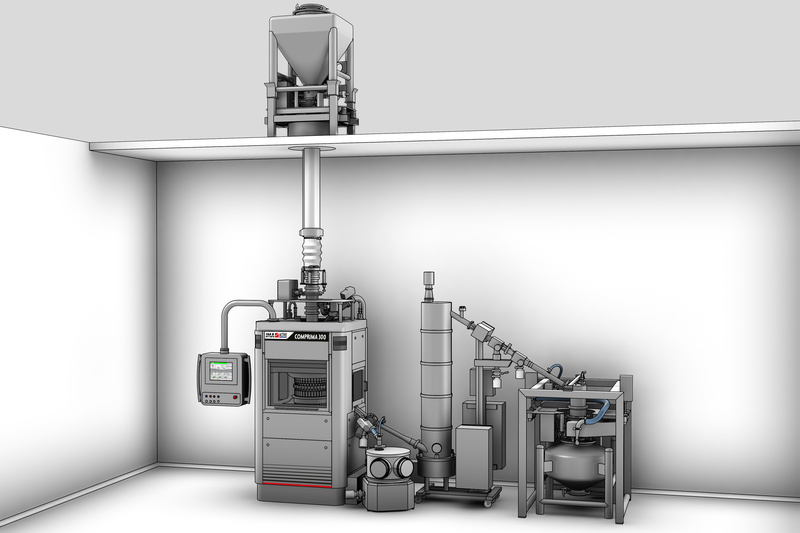 As an alternative configuration, ROTO CUBE and GHIBLI can work in line: wet granules can be quickly transferred in automatic mode from ROTO CUBE for drying into GHIBLI fluid bed. 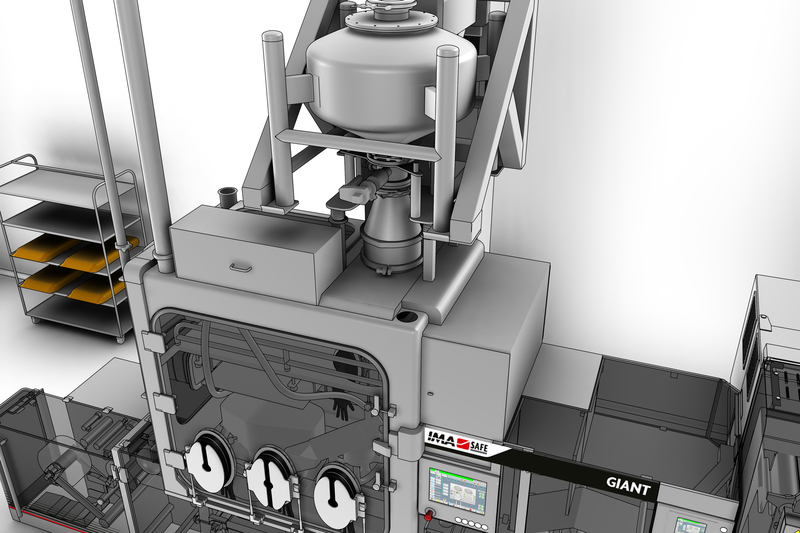 Ancillary equipment like mills, containment valves, lifting columns, pneumatic transfer systems become essential in case of contained production. 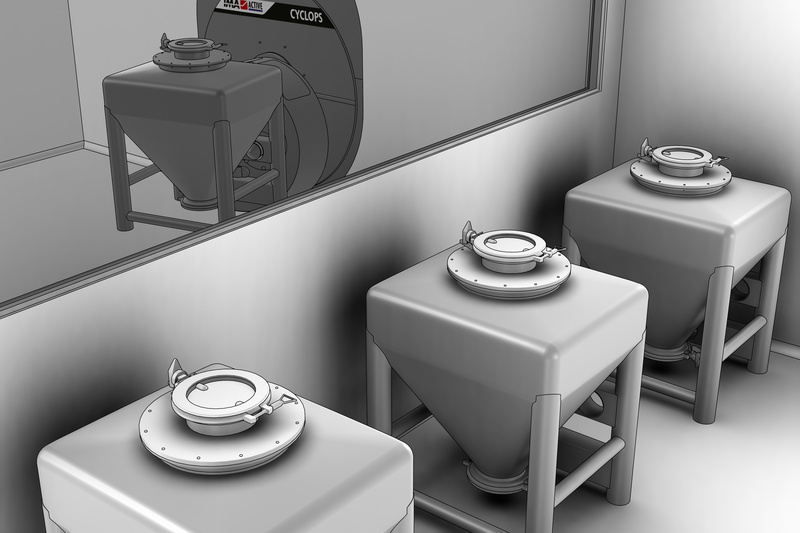 They can be integrated in the granulation machines to facilitate the automatic operations and ensure the proper containment level. Product blending into sealed IBCs. IBCs are used for product dispensing and blending of powders and granules. 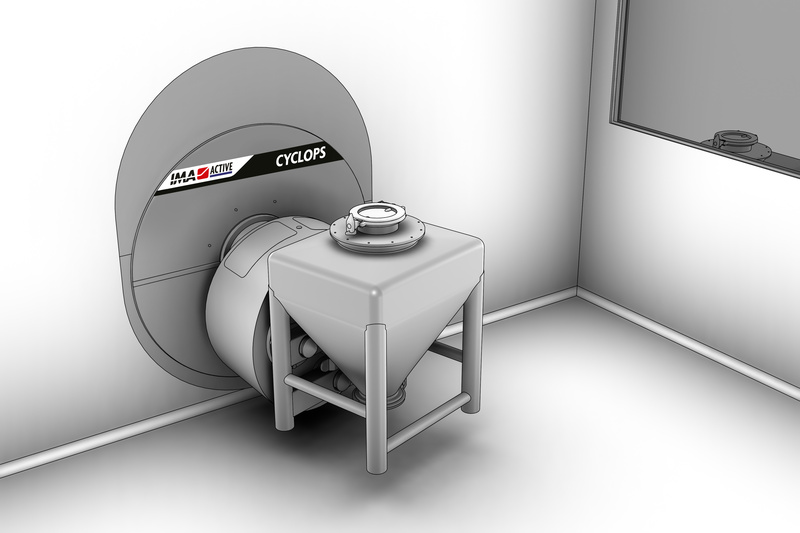 Blending is carried out on CYCLOPS bin tumbler so that no product feeding and discharge operations are required inside the blending area. A standard IBC can be easily fitted with isolation valves to guarantee a contained product loading and unloading. 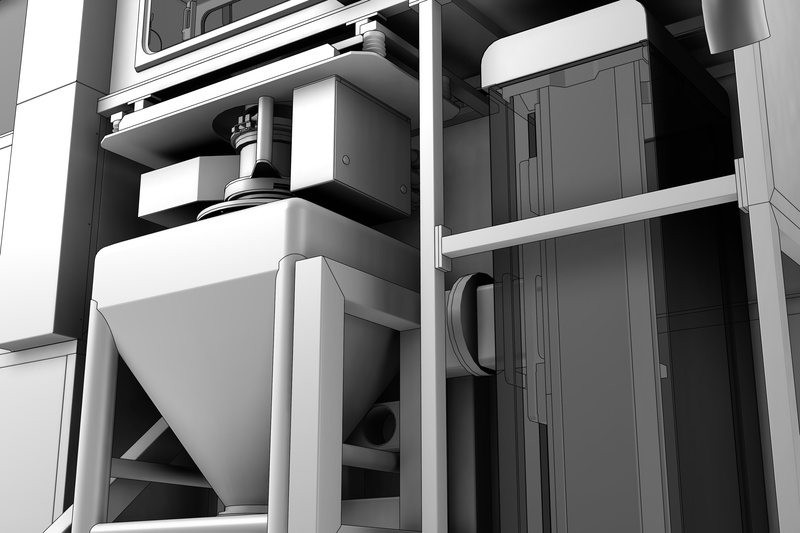 After blending, a dedicated bin storage can be arranged separately in order to let the product settle before continuing the process flow. 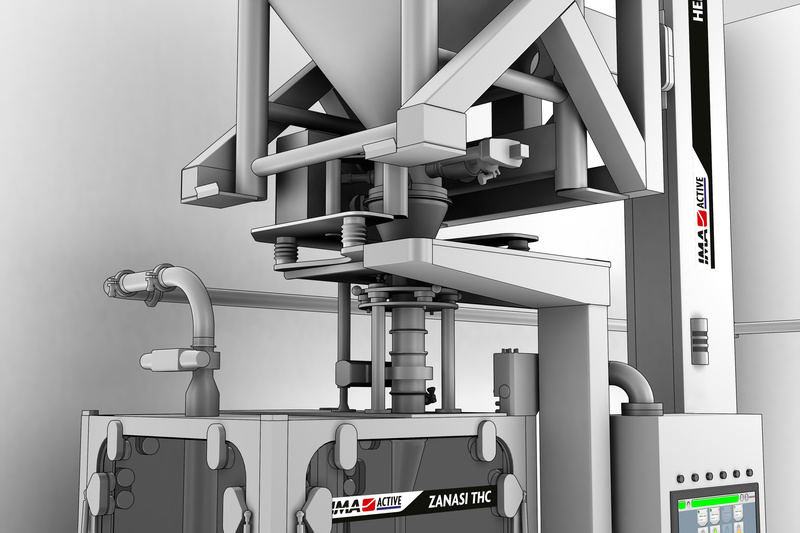 Zanasi THC is designed to encapsulate solid or liquid products in single or multiple dosing combinations, while ensuring complete isolation of the process area. Contaminated parts are minimized and extremely easy to be accessed by means of glove ports and RTPs (Rapid Transport Ports). ZANASI THC is designed for containment up to OEB 5 in all conditions – production, end of batch, maintenance, emergency, blackout – thanks to inflatable seals and Wash In Place system. 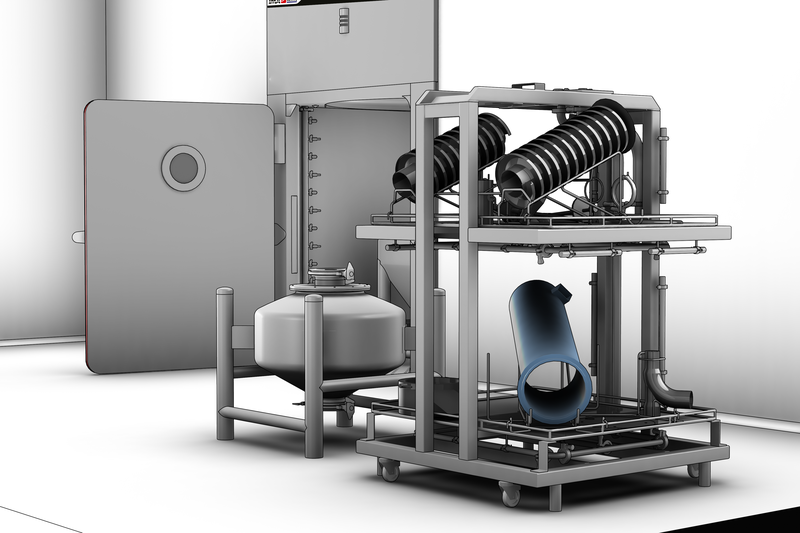 Product sampling, IPC units for weight check, dedusting and metal check are all designed and installed to maintain the highest degree of containment. 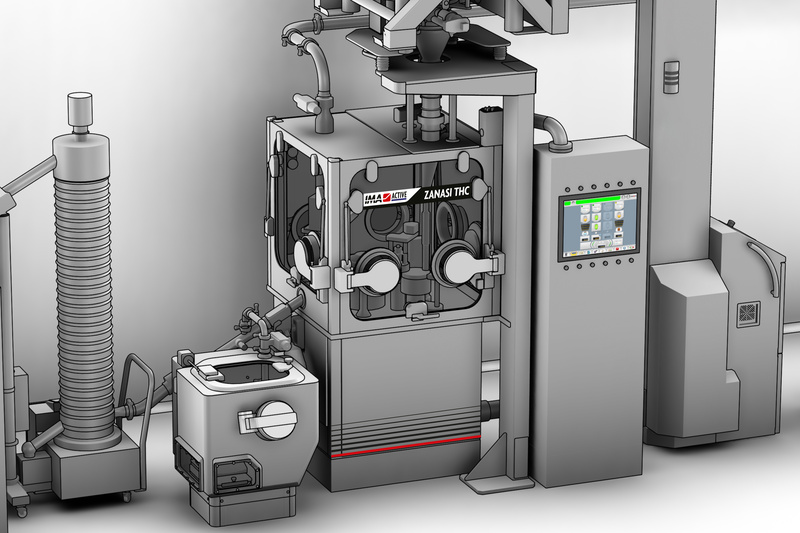 Even PRECISA, 100% weight checking machine for pharmaceutical products packed in hard gelatine/HPMC capsules, can be arranged for high containment. 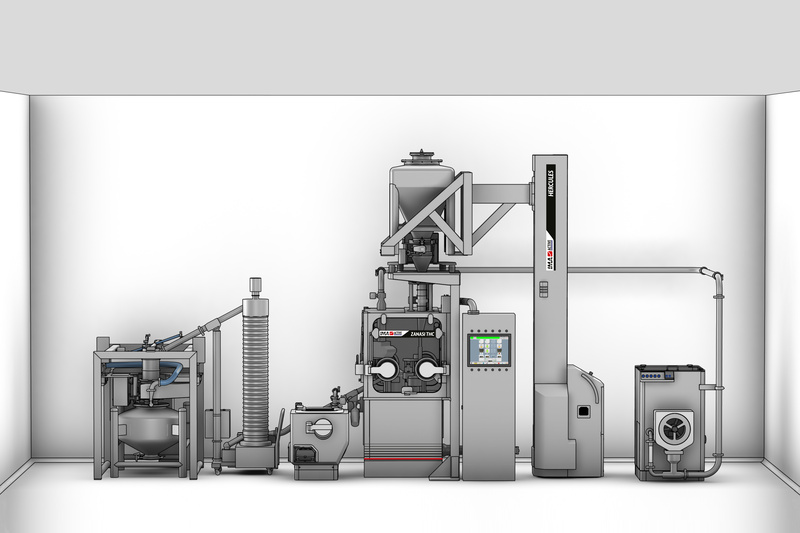 COMPRIMA tablet press machine is featuring very long dwell time and no segregation issues thanks to its well-established centrifugal force feed system. 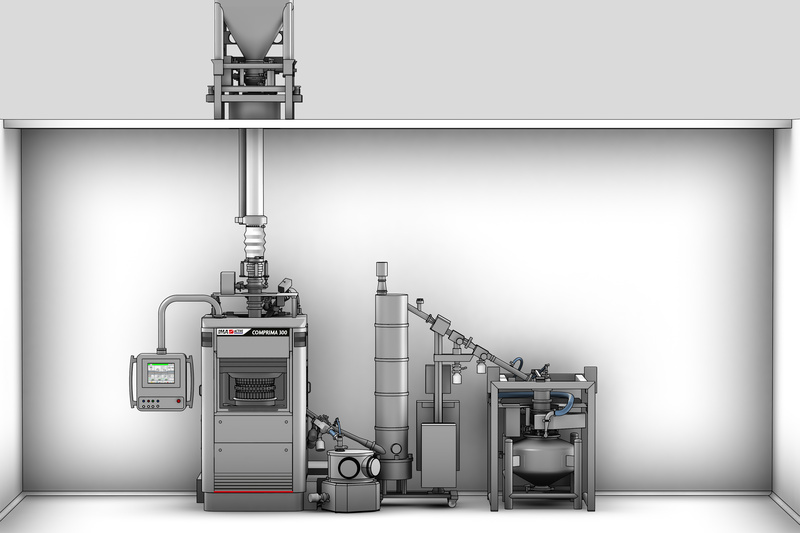 The machine is recommended for direct compression and ensures complete separation between the processing area and the mechanical area, thus limiting the surfaces in contact with the product. Sealed doors and negative pressure inside the processing area ensure both operators’ and environmental safety in all conditions – production, end of batch, maintenance, emergency, blackout. The system is capable to achieve OEB 5 in all mentioned conditions thanks to fixed spray nozzles, rotation of the turret and special patented solutions. At the end of WIP for Health & Safety decontamination, a completely automated cleaning cycle can be carried out. 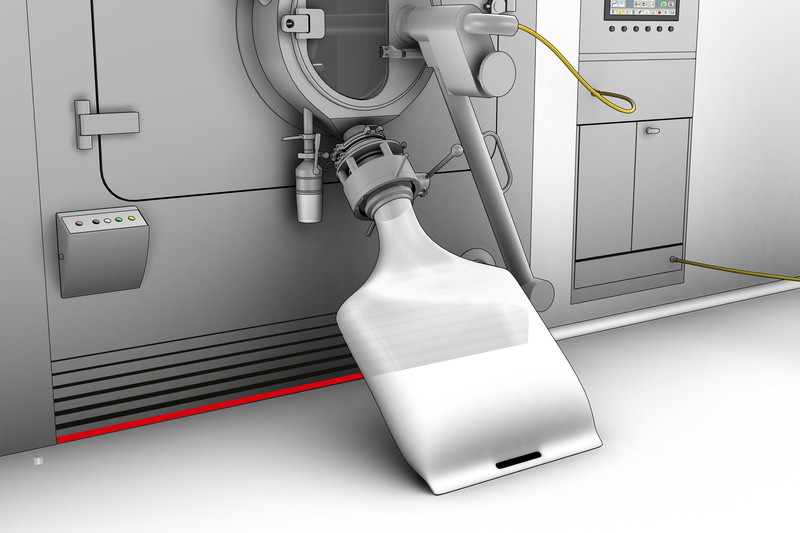 The operator simply needs to remove the size parts and fit the cleaning devices to start the cleaning cycle. On PERFIMA perforated pan, the use of inflatable seals on both front and side doors creates complete isolation. 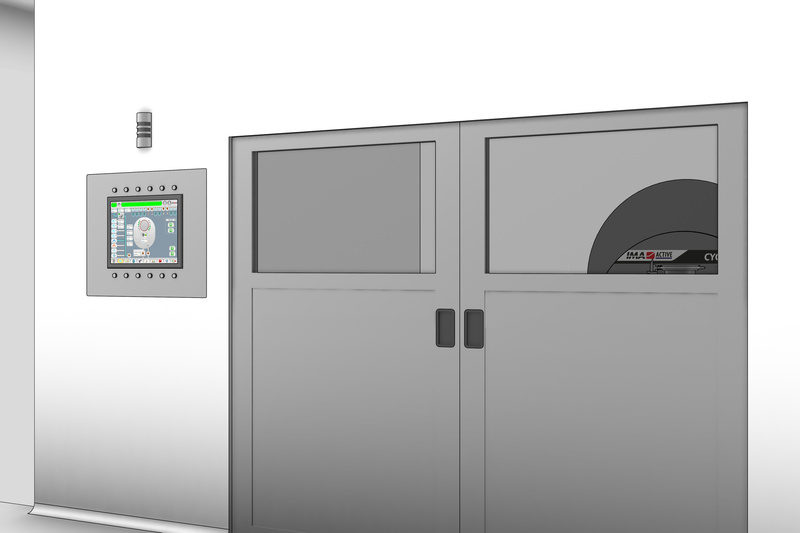 The management of the coating process, including spray guns adjustment, can be achieved without any need for the operator to be in contact with the product. 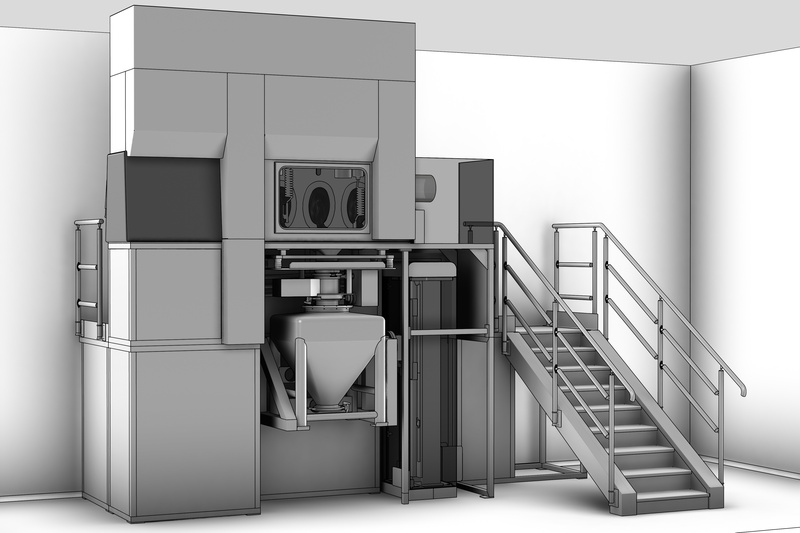 The machine can be fitted with automatic systems for product loading. The IBC containing the cores is elevated by HERCULES lifting column and fitted with TWINVALVE for contained transfer into the pan. The product is then loaded by gravity. Isolation at product exit is achieved through a single use bag for containment. 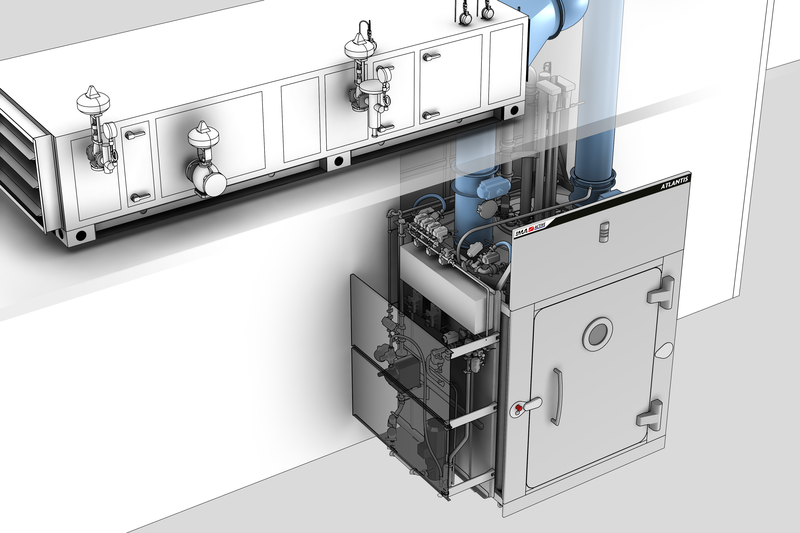 Accessibility into the isolated area can be achieved by means of glove ports and RTPs (Rapid Transport Ports): they allow the operator to work in the protected area without contamination. Quantity of glove ports and RTPs can be evaluated upon operation requirements. 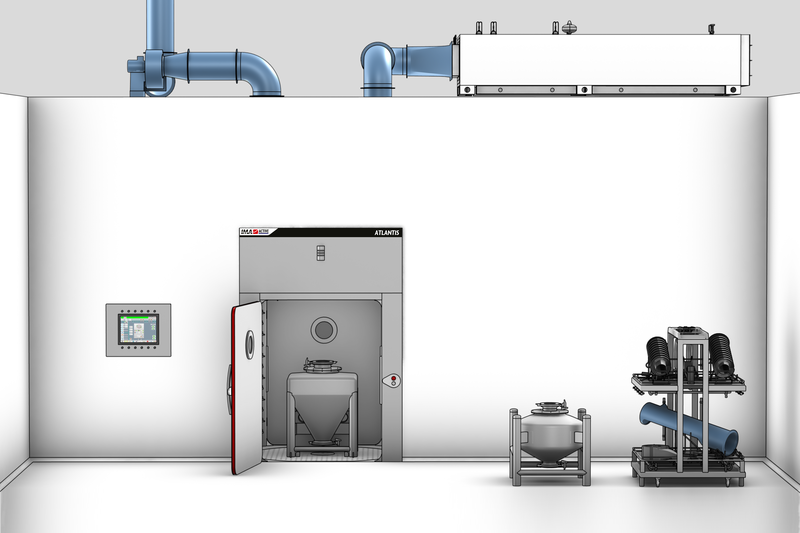 ATLANTISis a washing station designed to wash and dry, in a completely automatic mode, IBCs and other components used within the pharmaceutical industry. The basic configuration of ATLANTIS has a stainless steel cabin with square section and includes a single door with manual opening and inflatable seal. 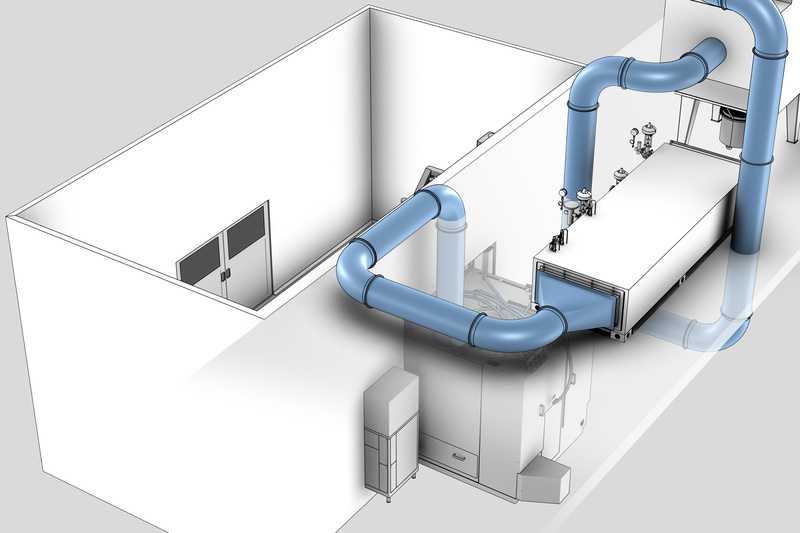 The machine is designed for through-the-wall installations: as an option, the machine can also be supplied with a second door for pass-through installation to separate the clean area from the unclean area. 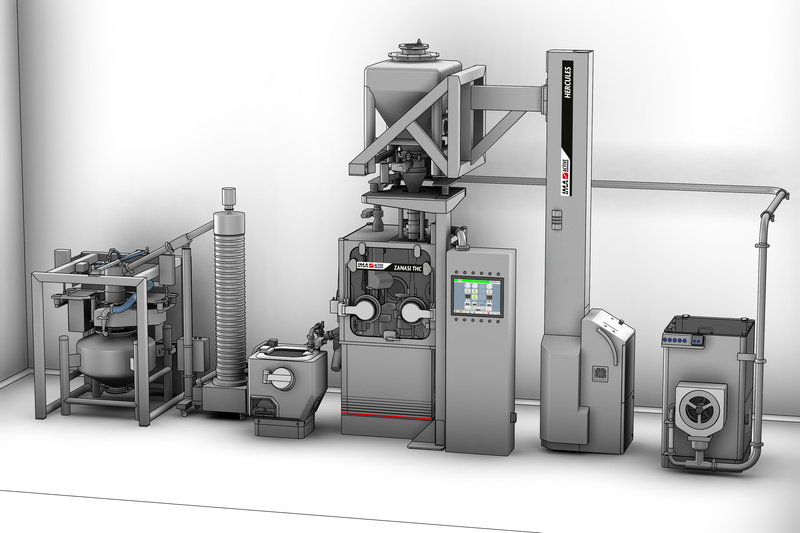 The design of the IMA blister packaging machines allows the best combination between feeding systems and containment technology. 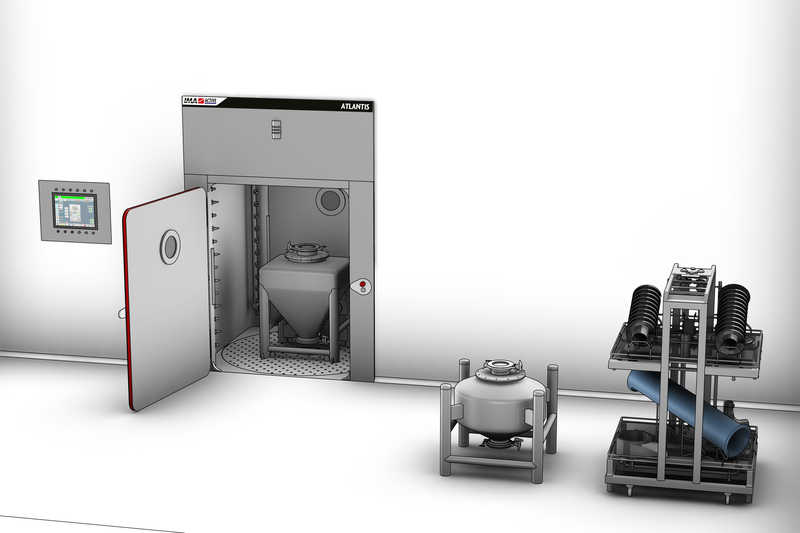 The reliability of the universal feeder SOMBRERO reduces to a minimum the intervention of the operator within the cabin of containment; its accessibility and smooth surfaces simplify cleaning procedures. IMA offers detailed custom-made configurations for any containment needs in both Counting and Blister Packaging of pharmaceutical solid forms.